Wednesday – my last full day in Barcelona. I had lunch with Ian, Lena and Oli, by the beach in Barceloneta. 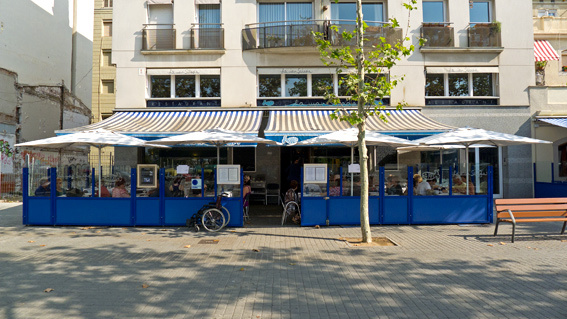 La Mar Salada is an award winning restaurant in Barceloneta, recommended by Time Out and Fodor’s. The chef, Marc Singla, previously worked with Ferran Adria (of El Bulli) at Talaia, so I was hoping to get a taste of their magic. 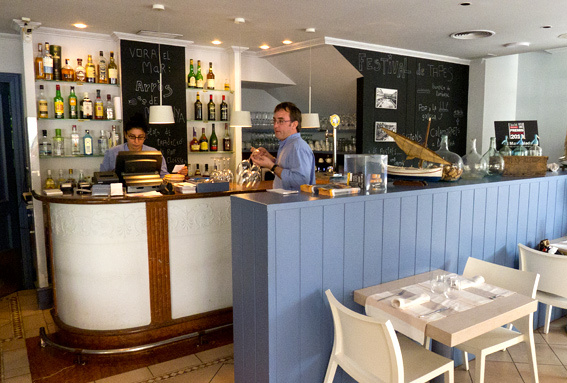 Unbelievably, La Mar Salada does a 3 course lunchtime menu, including a glass of wine, for €15. The menu changes on a weekly basis and the current one is available online here. For the first course, I ordered Coca cruixent d’oli amb seitons marinats i llit de tomàquet, which translated from Catalan, means crunchy oil coca with boquerones on a bed of tomato. Coca is a flat Catalan bread or cake, particularly popular in the Balearic Islands. Coca can be made of thick or thin dough, with savoury or sweet toppings – they can resemble pizza, though often, they don’t have tomato on top. Boquerones are raw anchovies, cured in vinegar (or a mixture of vinegar and water), before being preserved in olive oil. The coca looked nothing like I was expecting – it was quite thin and very crunchy, with tomatoes and boquerones on top. The boquerones had toppings of allioli, parsley in oil, minced parsley and garlic, etc. From the first mouthful, this was the taste and texture sensation I had been hoping for, not to mention the beautiful presentation on a piece of black slate. 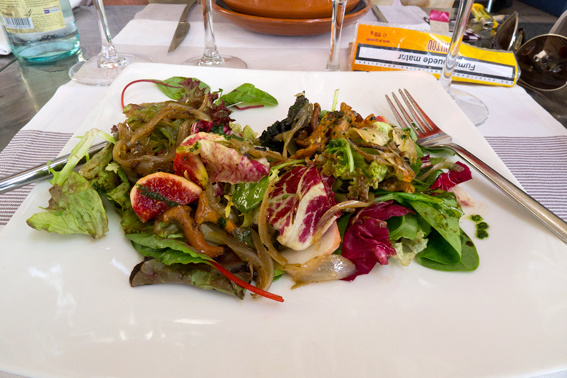 We were all impressed – Lena was so excited by her Autumn salad with artichokes, chanterelles and truffle oil, that she asked me to photograph it and email her the picture (along with pictures of everyone’s lunch, including the menu)! 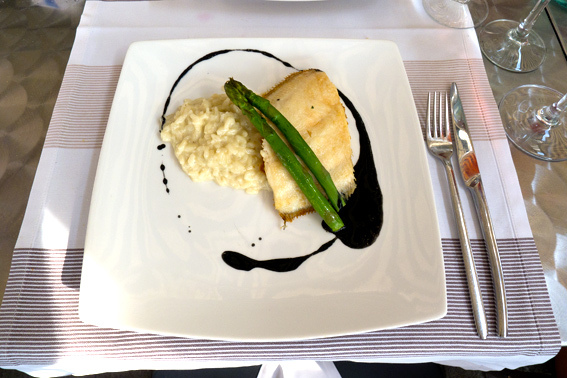 As main course I chose Gall a la Planxa amb risotto de gorgonzola i espàrrec bladers – John Dory cooked on a griddle, with a gorgonzola risotto and asparagus. John Dory, when cooked, is a little bit like sole, this one was pleasantly crunchy from the griddle. The risotto was heavenly and the pattern of sticky black liquid around the plate was a thick sauce made of squid ink (quite a common ingredient in Catalan cuisine). I have only one word to describe it all and that’s umami – to me all the flavour sensations had fused perfectly. Oli had the John Dory too, while Lena and Ian had Cod with chickpeas, egg and spring onion. There was also a fantastic and chunky looking steak tartare on the menu, which had me very tempted, but I’d wanted to eat something hot. For pudding I ordered Crème fraiche amb melmelada de tomàquet a la vainilla – tomato marmalade with crème fraiche and vanilla. 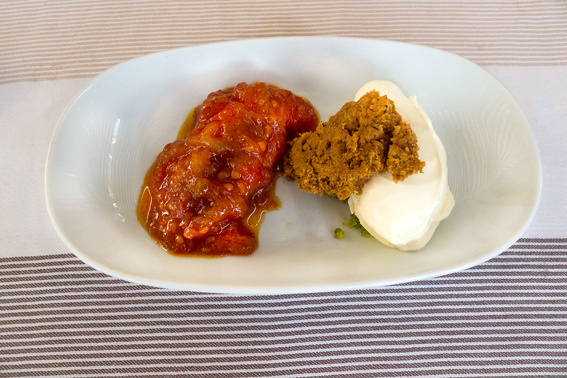 Yet another delight – the tomato marmalade was sweet like a compote, but still tasted subtly of tomato. The crème fraiche was served with a crunchy biscuit and a sprinkle of crushed pistachio. 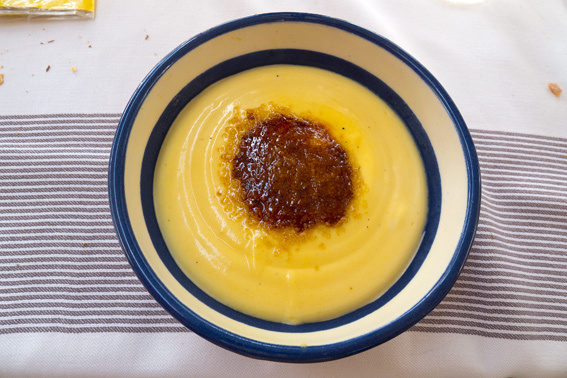 Ian had a Cream passion fruit – quite like a crema catalana flavoured with passion fruit, while Oli had Almond and chocolate rocks. I’d give the food and presentation 11 out of 10 – it was outstanding quality for €15 – this restaurant deserves a Michelin star! Expect to pay considerably more in the evening. 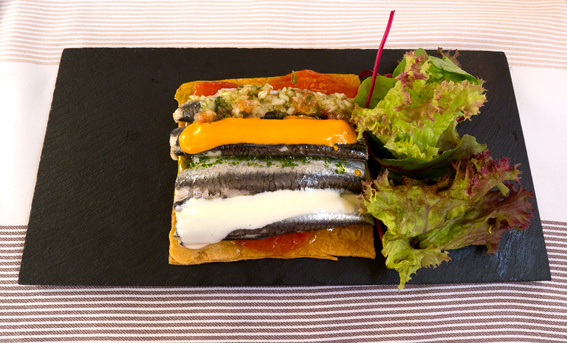 This entry was posted in Barcelona, Barcelona Bars and Restaurants, Eating Out, Fish, Food, Restaurants, Spanish and tagged Barceloneta, boquerones, coca, El Bulli, John Dory, La Mar Salada, Marc Singla, risotto, tomato marmalade, umami. Bookmark the permalink. Ooh – I´ve been here but went at night. Damn…wish I´d known about the lunch menu! Awesome Blog! =) We are visiting Barcelona for the first time late December and hoping to eat at some great places…definitely going to your recommendations as well. Thanks so much! Btw, any suggestions for New Years Eve? Thanks Tisha – look for a nice bar on New Year’s Eve, like Iposa or maybe El Xampanyet on C/Montcada, 22.